Most people can identify customer service catch phrases from watching television commercials. These quotes help those in the customer service industry to remember to be helpful to upset customers who do not know what to do to fix their problem. The job of the customer service agent is customer satisfaction: salesmen might make the sale, but the customer service agent makes sure that the customer stays happy which, in turn, might result in more sales. When it comes to service catch phrases, there are actually many phrases that people use both in and out of the office. Catch phrases that have to do with customer service are often incorporated into the business's promotional materials, and they are often the reason that employees stay on track to provide good customer service. With these little phrases in their minds, employees can stick to the task of helping employees, no questions asked. 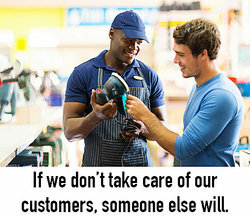 If we don't take care of our customers, someone else will. The customer is always right." Of course, this isn't true, but this message helps remind workers to meet their customers' needs. Many popular commercials have taken customer service catch phrases and turned them into ad slogans that can get stuck in our heads pretty easily. State Farm - When was the last time that you saw a commercial and the State Farm Agent spokesperson was asking, "Are you in good hands?" He is referring to the fact that State Farm Insurance agencies are ready and willing to help customers. Burger King - "Have it your way" emphasizes that the customer is always right, and tells the customer that they can make decisions to build their perfect burger according to their needs. Why are they so successful? Usually, marketing teams are behind the development of customer service slogans, choosing the right buzzwords and pairing them with practical information about customers and their needs. With usually less than ten words, these phrases catch the attention of the viewer and make them want to be a customer of the company. Good customer service - as shared through good customer service slogans - is sometimes a more important factor in a purchase, even more than a low price. Television commercials are the main means that these popular catch phrases are spread. This makes sense, since most people watch television on a regular basis. However most commercials are short: businesses have usually between thirty seconds and one minute to share their company's purpose, aim, and that they are their for their customer! With the help of service catch phrases, companies can instill their own understanding of helping people in the general public, all while helping boost their own employee morale with their workers. Walt Disney had a famous service catch phrase: "Do what you do so well that they will want to see it again and bring their friends." Obviously, he was speaking about making movies, but this certainly applies to many ideas in business. By satisfying customers, you can encourage them to rely on your business and recommend you to others. Walt Disney is certainly proof that with the right customer service and the right selling points, a business can be really successful. For more information about customer service catch phrases, ask your local businesses how they promote their commitment to customer service. "Customer Service Catch Phrases." YourDictionary, n.d. Web. 21 April 2019. <https://quotes.yourdictionary.com/articles/customer-service-catch-phrases.html>.